The Dr. Nancy Hall Public Policy Leadership Award is awarded annually to honour the spirit of the late Dr. Nancy Hall, who acted as a key advisor, consultant, and friend to CMHA BC for more than 15 years and passed away in 2011 after a battle with cancer. This award recognizes an individual or group in BC that has influenced mental health policy and contributed to positive mental health. 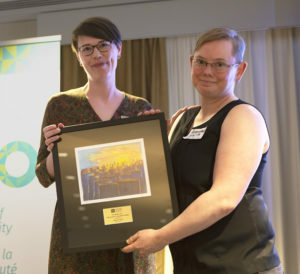 CMHA BC is honoured to present the 2018 Nancy Hall Award to Adrienne Smith, a human rights activist and drug policy lawyer. Adrienne lives and works in the Downtown Eastside where they are working to reduce the harm the law causes on marginalized communities. Two key aspects of Adrienne’s work made them an excellent nominee for the Nancy Hall Award. First, they have been a strong advocate for rights of people who use drugs, and particularly those engaged in the criminal justice and provincial correctional systems. Adrienne recently settled a BC Supreme Court case that changed prison policy across BC and secured access to opiate replacement therapy, a key evidence-based health service, for prisoners in BC jails. They have also appeared at the BC Court of Appeal and Supreme Court of Canada to advocate for the human rights of people who use drug use. In addition to Adrienne’s work around drug law and policy reform, they are also a strong and vocal advocate for the human rights of transgender people. Adrienne has advocated in support of trans inclusion policies in schools, political parties, and with respect to access to crucial community services. They provide pro bono legal advice at the Catherine White Holman Wellness Centre, a community health and wellness program organized by and for transgender people. Adrienne also participated in producing the transrightsbc.ca know-your-rights web tool, and they run workshops on this and on other legal issues for service providers and members of their community. We at CMHA BC know how crucial community inclusion and access to vital services are to a person’s overall mental health and well-being, and how detrimental exclusion and stigma can be. By showing such incredible dedication to eliminating discrimination and barriers experienced by marginalized communities, there is no doubt that Adrienne has influenced laws and policies across BC to ensure that they better support positive mental health.